SINGAPORE (Reuters) - SaladStop owner Adrien Desbaillets has eased off on expansion plans for his organic food chain in Singapore because high wages are pressuring profit margins at a time when the affluent city state is grappling with low growth and slack global demand. Instead Desbaillets is branching out in Manila, Jakarta and even in wealthy Tokyo in a worrying sign for Singapore's small, open economy. Indeed, while the city state's economy is expected to grow between 1-2 percent for the year, analysts say the wage-cost pressures are flashing warnings of a recession. 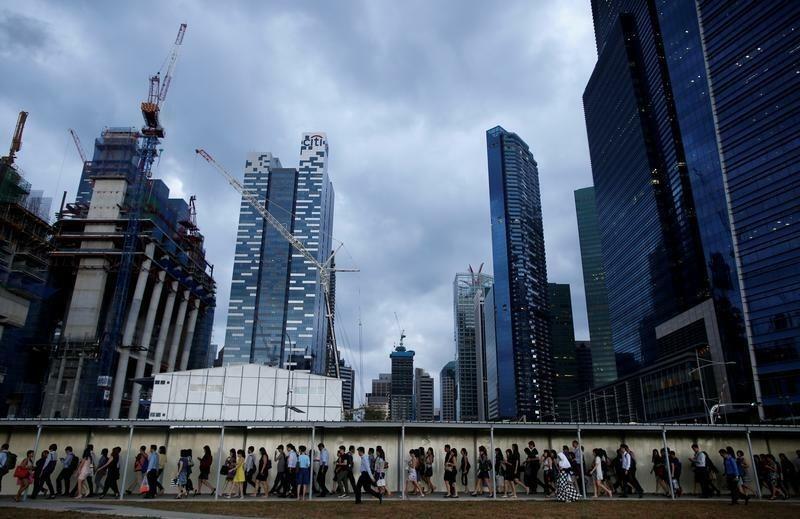 At roughly 43 percent of gross domestic product - though below the 55 percent world average - wage costs in Singapore are now at levels which historically had preceded recessions in 1985, 1997 and 2001. The trouble is that the higher wages are raising business costs at a time when export-oriented Singapore has been hard hit by a cooling China, subdued domestic consumption, a downturn in commodities and global uncertainty due to Britain's vote to leave the European Union. "We would have opened two or three more outlets in Singapore if it weren't for the high wages ... and we would have taken on more projects," said Desbaillets, whose chain has 15 outlets in Singapore, eight in Manila and is due to open in Jakarta and Tokyo in October. "We've been able to hedge our risk a little with our expansion abroad." Desbaillets pays his Singapore staff S$1,600 to S$3,200 ($1,191 to $2,382), versus S$300-S$400 in Manila. His business is growing, but others with less firepower are struggling. They include the majority of the 12,000 companies that Kurt Wee, President of the Association of Small & Medium Enterprises, represents. "We've started hearing of decisions to call it a day," Wee said. Almost 42,000 businesses ceased in the first half of this year versus nearly 49,000 in the whole of 2015, government data shows. Total nominal wages rose 4.6 percent per year on average over the past decade, compared with a 0.5 percent average annual growth rate of value-added per worker in that period. And recent data showed the unit labour cost index hitting a record high of 116.7 in the second quarter. Trinh Nguyen, Natixis' senior emerging Asia economist says this increases recession risks. "It squeezes firms' profit margins and erodes exporters' ability to compete," Nguyen said. "While they cannot earn more money externally ... they cannot reduce cost structures." Singapore is the fourth most expensive city in the world, according to Mercer, a global consultancy. The high wages partly reflect that. But they would have been lower without the curbs on foreign workers introduced in 2011 amid disquiet over immigration. The tighter rules also hurt productivity, recruiters say. "Anecdotally, companies are known to have hired token locals – employees needed to meet quotas so that the company can hire another foreigner," said Lee Quane, Asia director at recruiting consultancy ECA International. A shortage of talent in sectors like IT and life sciences means wages in those industries grew faster than the economy, recruiters say. "Maybe we are killing the geese that lay the golden eggs."